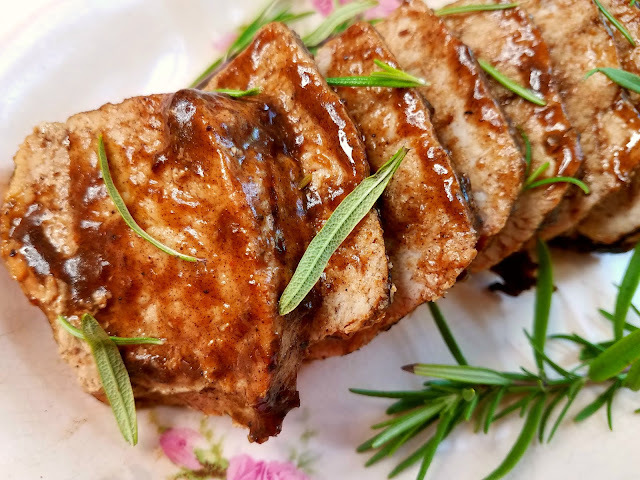 Grilling Pork Tenderloin is easier than you think, and when you add in a wonderful Cherry Chipotle marinade and sauce. you'll find yourself fighting over the last piece! 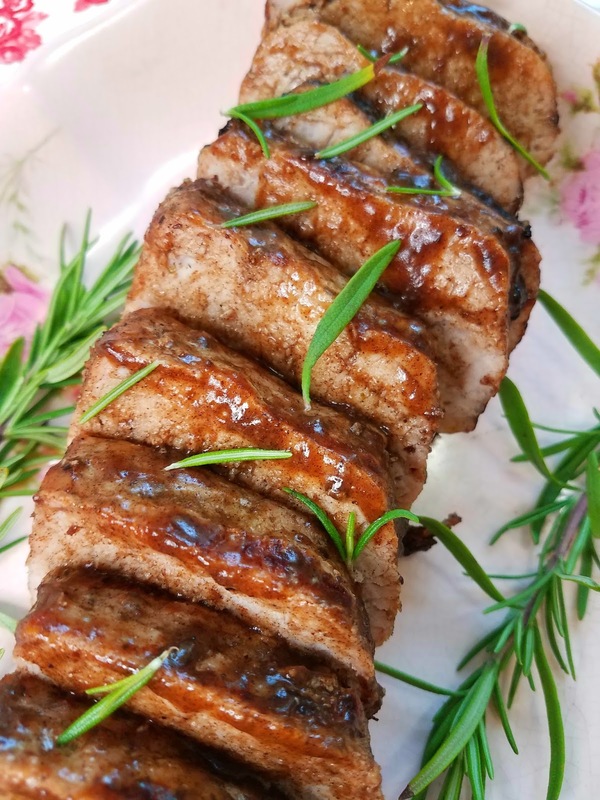 If you have never tried grilling a pork tenderloin, you must try! It grills up pretty quick since it's a smaller, boneless cut of meat. I'll teach you my trick though, for keeping it moist, as pork can dry out quickly especially on the grill. The secret to today's Cherry Chipotle Marinade starts with Not Ketchup's Cherry Chipotle Sauce. 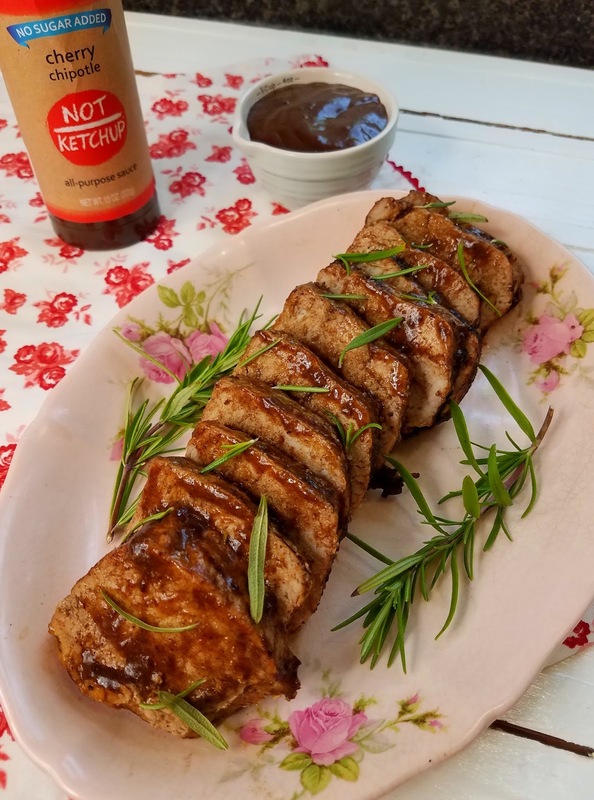 Not Ketchup has a wonderful line of sauces that have no added sugar, corn syrup or artifial sweeteners! I kid you not! they have a wide range of grilling and dipping sauces that will tantilize your taste buds! I love that I can just order them on Amazon! My husband is diabetic, so finding sauces that won't send his blood sugar levels sky rocketing is impossible.. till now! I love that I can trust the ingredients in them, and the flavors are just amazing! This Cherry Chipotle sauce is not too hot! I can barely handle mild heat.. I am such a wimp, and I love this sauce! It is very kid friendly, so don't let the name scare you off! This sauce is a wonderful blend of flavors that goes great with pork, salmon chicken. I love to make a marinade for it, with the sauce, and then use the sauce to dab on just at the end of grilling as well for serving. I use a gas grill, but you can use charcoal as well. Grilled Pork tenderloin in a cherry chipotle marinade and sauce. Lightly sweet, but not too spicy, this mild sauce is perfect for every one in the family! 2 Tablespoon Vegetable oil for brushing on the grill. Combine marinade ingredients. Pour half into a resealable bag with the pork tenderloin. Seal and cover pork. refrigerate and marinate for at least 1 hour prior to grilling. Cover and refrigerate remaining marinade. to use in a later step. Preheat grill to medium high heat. Drain and discard the marinade from the pork. Brush grill with oil to prevent meat from sticking. Place tenderloin over direct heat. Let grill for 4-5 minutes on each side turning to cover all 3 sides. Remove from direct heat and place tenderloin back onto indirect heat toward the edge near the heat for about 8-10 per side, or till internal temperature reaches 145° with a thermometer. remove the pork tenderloin from the grill, and place onto a sheet of aluminum foil. Bring up the edges of the foil around the pork. Pour in the remaining marinade. seal the foil. Allow the pork to rest for 10 minutes. Before slicing and serving, brush on 2 Tablespoons of Cherry Chipotle sauce over the top of the tenderloin. Serve warm. Our Sponsors are hosting a giveway! samples and product to use for creating #BBQWeek recipes. 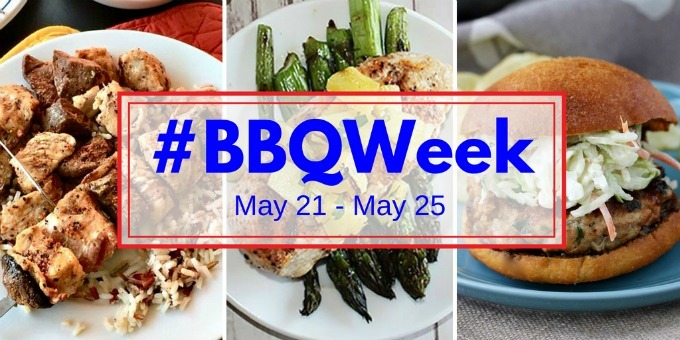 The #BBQWeek giveaway is open to U.S. residents, age 18 and up. There will be three winning entries that will be verified. The prize packages will be sent directly from the giveaway sponsors. The #BBQWeek Bloggers are not responsible for the fulfillment or delivery of the prize package. Participating bloggers and their immediate family members cannot enter or win the giveaway. or associated with social channels mentioned in the #BBQWeek posts or entry.